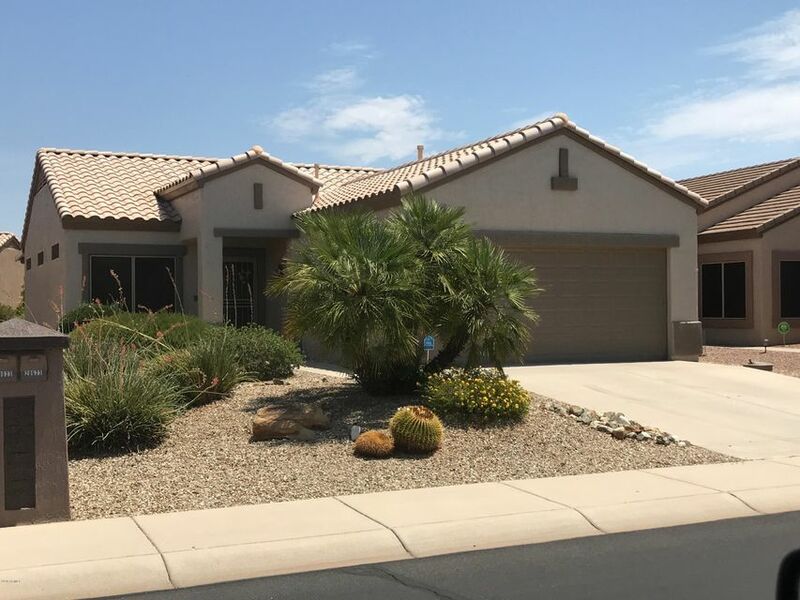 All SUN CITY GRAND DESERT SAG homes currently listed for sale in Surprise as of 04/23/2019 are shown below. You can change the search criteria at any time by pressing the 'Change Search' button below. "Located on a large quiet cul-de-sac lot this home has a unique and large back patio area that is an entertainers dream. Upgraded landscaping front and back. Bay windows. Hot water always ready with added hot water heater circulation unit as well as a new actual water heater.. Expanded pantry in kitchen with breakfast nook. Sensational expanded back patio is a tiered custom design. Entire exterior newly painted late 2018. 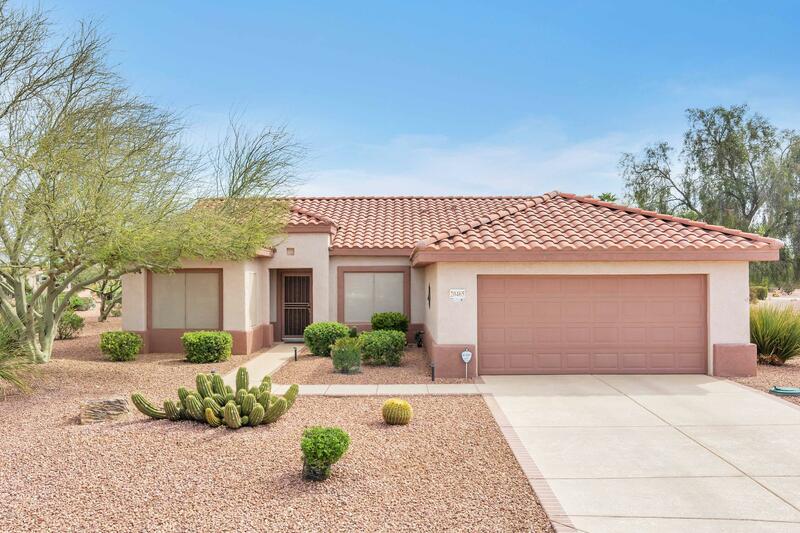 Very popular Palo Verde model that has been well taken care of and is"
"WORDS CANNOT DESCRIBE THIS EXQUISITE 2 BEDROOM PLUS DEN 2 BATH HOME, THE LAYOUT OF THIS PALO VERDE FLOORPLAN IS PERFECT FOR THOSE LOOKING FOR A GREAT ROOM CONCEPT WITH SPLIT FLOOR PLAN. GREAT CURB APPEAL WITH NICE LITTLE COURTYARD IN THE FRONT. THIS HOME SHOWS PRIDE OF OWNERSHIP AND HAS BEEN WELL KEPT. 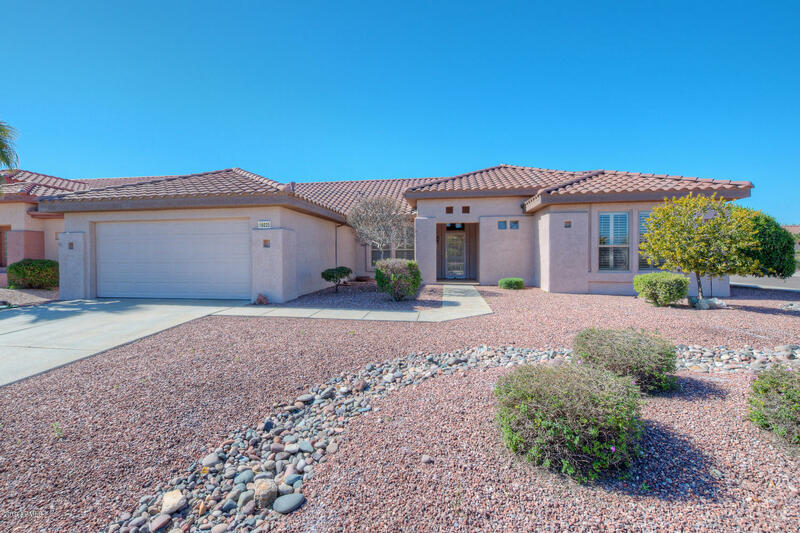 THIS HOME CAN BE TURN KEY WITH EVERYTHING IN THE HOME, MOVE RIGHT IN AND ENJOY BEAUTIFUL SUN CITY GRAND AND ALL IT HAS TO OFFER! NICE SIZED KITCHEN WITH PANTRY AND BREAKFAST BAR, EAT IN KITCHEN AN"
"Beautiful Verbena Model exuding the love & care. Light & bright open floor plan w/ great curb appeal. Tile floors & plush carpet throughout. Large rooms offering functional space for furniture placement & enjoyment. This home has loads of storage space inside the home's closets & cabinets & also in the garage. The master bedroom offers a bay window & walk in closet. New Trane HVAC system in 2014. The water heater is powered by a solar panel that is owned outright. 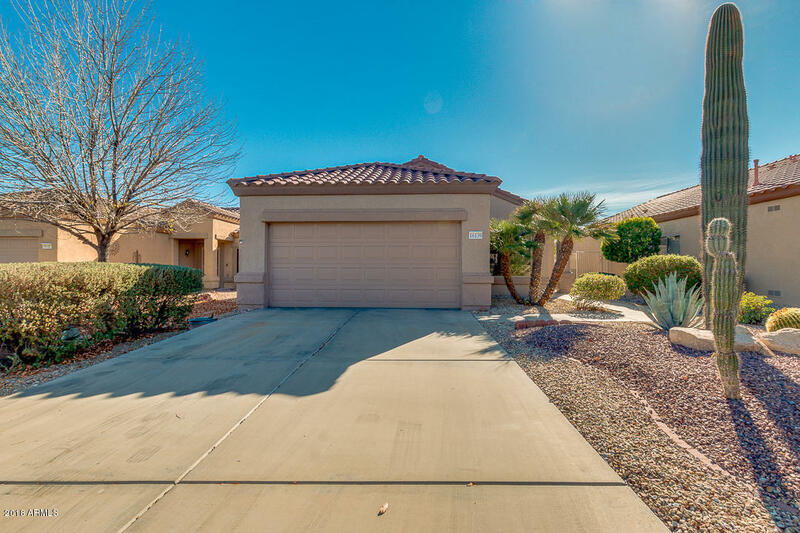 The sunscreens are in great con"
"Beautifully maintained Madera floor plan located on a huge 16K+ Cul De Sac lot in Sun City Grand. This lovely home has a beautiful eat in kitchen with en vogue gray counter tops and white cabinets & solid wood flooring. There are two generous size bedrooms along with a den. The Great room concept allows you to be in constant contact with your guests, as you entertain. The back patio faces North East giving you all day reprieve from the afternoon sun as you enjoy your built in BBQ and large pri"
"Adorable,well maintained, move in ready 3 bedroom 3 bath home. 1852 sq ft includes the permitted separate guest quarters attached to garage, leads to entry. 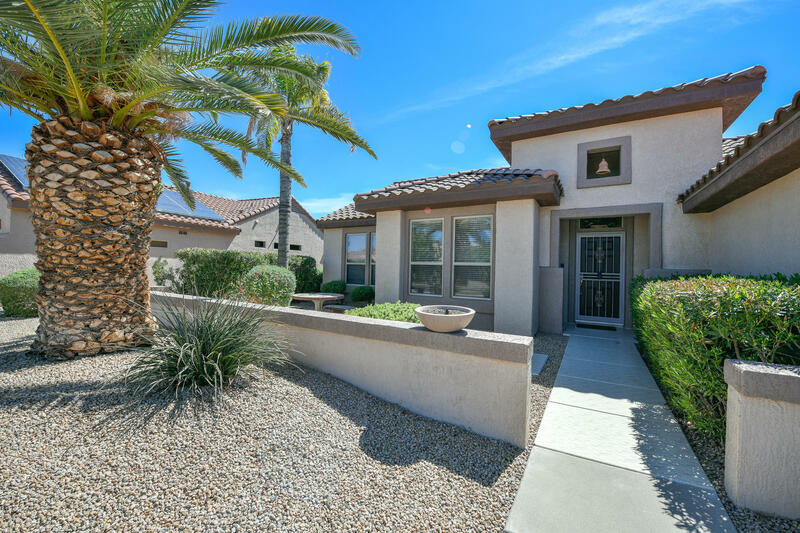 Nestled within Sun City Grand's Desert Sage 2 Adult Community (55 and older). Open floor plan with 9 foot tall ceilings, tile floors throughout except master bedroom and guest bedroom are carpet. Stainless steel appliances and breakfast bar. Pull out drawers in kitchen. Master bedroom has a large bay window and walk in closet. Master ba"
"Fabulous Location! Lovely Juniper model, move in ready, furnished including a NEW $2800 refrigerator, priced to sell with BRAND NEW HEATING AND AC SYSTEM, washer, dryer, fresh interior & exterior paint!!! 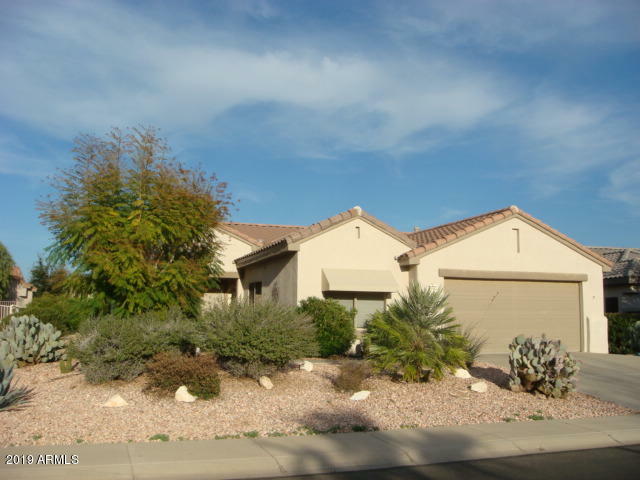 Located in a very quiet & private cut-de-sac attached to a lovely walking trail! The kitchen has upgraded slide out cabinets and has an eat in kitchen looking right out to the trail and park area. The master bedroom has an extended bay window for an extra large bedroom attached to the master ba"
"Come see this Amazing home with New granite countertops. Neutral colors with Tile throughout. 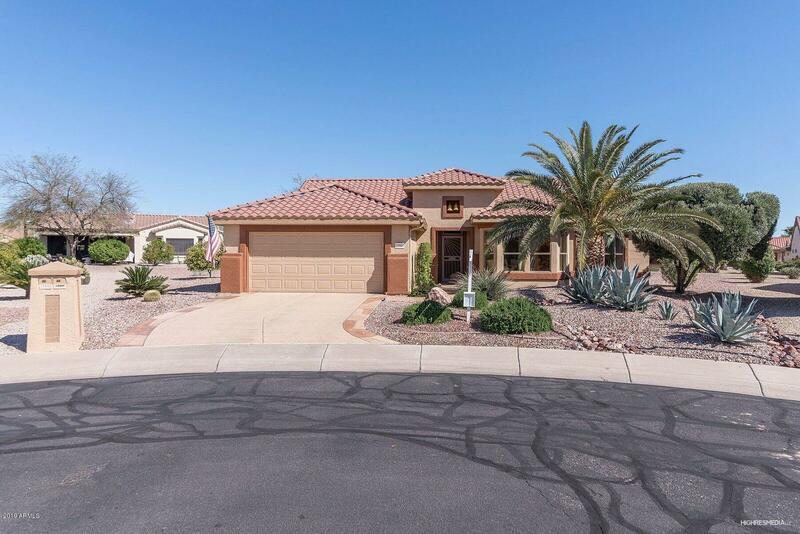 Beautiful Open floor plan in Sun City Grand that is Move in ready. Storage cabinets in garage and a Cozy backyard covered patio."